Since our inception Case Financial has been helping a wide variety of organizations ensure that their IT Security is compliant with the new Government Regulations and best industry practices. To assure that each one of our clients is prepared for their ensuing compliance audits, Case Financial offers Full Internal and External Information Security Audits. Each Network Security Auditing team is assembled to best match their expertise with our client’s unique requirements and is led by at least one of our CISA/CISM Certified Auditors. 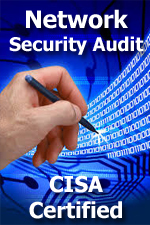 The rigorous training that CISA/CISM Certified Auditors undergo guarantees that they are best qualified to help protect your secure information (see brochure). In fact, the Federal Reserve requires each of their compliance auditors hold a CISA Certification. Our rigorous examination of your organizations networks and employees during an audit is aimed at exposing every potential threat to your secure information from inside and outside of your organization while minimizing interference with your daily operations. After we have conducted all the necessary tests and interviews and examined all necessary documentation, you will receive a detailed report of our findings, citing best industry practices for eliminating all threats uncovered. For more information on how to become better prepared for your next compliance audit by utilizing our industry leading Network Security Auditing Services, please feel free to download our informational brochure and contact us Toll Free at 1.877.728.9627. Protect your valuable customer data from potential threats. Ability to communicate effective with network security novices and experts alike. Solutions for any deficiencies found in your network security. Please visit our Contact page to request more information about Network Security Auditing.